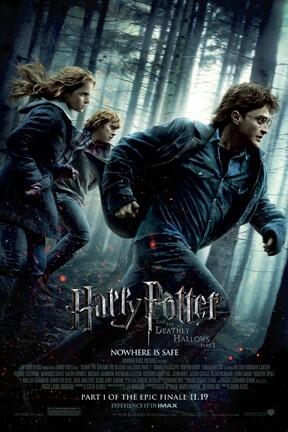 Without the guidance and protection of their professors, Harry (Daniel Radcliffe), Ron (Rupert Grint) and Hermione (Emma Watson) begin a mission to destroy the Horcruxes, the sources of Voldemort's immortality. Though they must rely on one another more than ever, dark forces threaten to tear them apart. Voldemort's Death Eaters have seized control of the Ministry of Magic and Hogwarts, and they are searching for Harry -- even as he and his friends prepare for the ultimate showdown. Harry Potter and the Deathly Hallows: Part 1 is not showing in any theaters in the area.